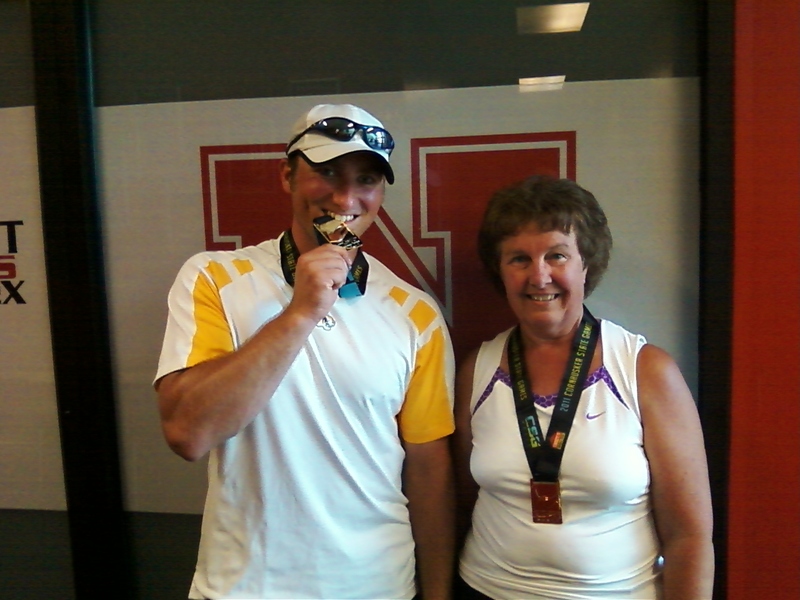 Renate Mark and Jon Rohloff claimed the Gold Medal honors at the 2011 Cornhusker State Games on Sunday in the 7.0 Mixed Doubles Division. Playing in less than ideal conditions – air temperature at 100 degrees with high humidity and purple courts raising the on-court temperature to almost illegal limits – they defeated Cathy Nelson and Mark Schwarting of Lincoln in round one of round robin play 7-6, 6-4. In round two, they played against Julie Benes and Stan Benes of Seward. They won the 1st set 6-2, and were up 3-0 when Julie had to retire due to the heat, giving Renate and Jon the title. Congratulations on a good win and championship honors. Others Fremont players competing in the Cornhusker State Games included Brian Mark who teamed up with Jon Rohloff in 4.0 Men’s Doubles. They lost in the first round to the eventual champions, Zachary and Doug Tegler of Eagle, 6-3, 6-3. Dana Mark played in the 4.0 singles event, winning round one by default over Thomas Walker of Omaha. He then lost in round two to the No. 3 seed, Brian Richmeier of Omaha, 6-1, 6-3. 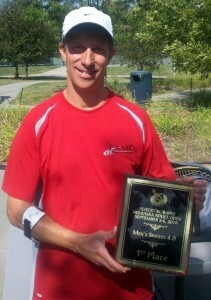 Josh Sammons played in the 3.5 singles event. He was unable to play his first round due to work schedule. That moved him into the consolation bracket where he won round one over Luke Derowitsch by default. He also won round two over Kunal Sharma by default. He then lost in the Semifinals to Kurt Weekly of Lincoln 6-1, 6-1. Mark Leahy, the No. 1 seed, brought home the runner-up honors in the 4.0 Men’s singles event at the recent Centre Court-KFC-Sidner Law Office Fremont Adult Open. In the Quarterfinals, Mark defeated Brad Miller of Omaha 6-4, 6-0, then downed Mark Jackson of Bellevue in the Semifinals 6-0, 7-5. In the Final, he was defeated by No. 2 seed, Kiran Poda of Lincoln in a 3-setter, 6-4, 1-6, 6-2. In the Men’s 4.5 doubles event, Mike Willman of Fremont and Roland Augspurger of Columbus also won runner-up honors. In round robin play, they defeated Ray Montejano of La Vista and Clark Thompson of Omaha in straight sets, 6-3, 6-3. In round two, they lost to Jeff Fredricks and Lee Fredricks of Omaha in a 3-setter, 4-6, 6-2, 6-2. Brian Mark and Dana Mark teamed up in the 4.0 Men’s doubles. They won the semifinals over No. 1 seed, Mark Jackson of Bellevue and Joseph Lopez-Wilson of Omaha by default. They then lost in the Final to No. 2 seed, Ray Montejano of La Vista and Clark Thompson of Omaha, 6-1, 6-3 to also claim runner-up honors. Thank you to all who participated in the tournament, and a BIG thank you to Diana Meyers and Justin Bigsby and their assistant, Amy Ahrens, for a well run tournament. Mark Leahy and Chris Westergaard teamed up to win the 45 Men’s Doubles division at the Centre Court-KFC-Sidner Law Office Fremont Adult Open played June 17-19. In the semifinals, they defeated Curtis Goebel of Columbus and Rick Spalding of Fremont 6-4, 7-5. In the finals, they won over Roland Augspurger of Columbus and Mike Willman of Fremont in a 3-setter 4-6, 6-2, 6-2, giving them the championship and runner-up honors to Augspurger and Willman. Doug Hartman of Fremont and Jim Jorgensen of Blair also teamed up in the 45 doubles. They lost to Augspurger and Willman 4-6, 6-2, 6-2 in the semifinals. They then defeated Curt Goebel of Columbus and Rick Spalding of Fremont 7-6(4) 7-6(3) to claim the consolation trophy. Brian Mark and Renate Mark teamed up in the 8.0 Combo Mixed Doubles and brought home the championship trouphy at the Centre Court-KFC Sidner Law Office Fremont Adult Open played June 17-19. In round robin play, Brian and Renate defeated Laura Smidt and Mark Smidt of Keokuk, IA in a 3-setter, 6-2, 6-7(4), 6-3. In round two, they had a straight-sets win over Carilyn Garrett and Kunal Sharma of Omaha 6-4, 7-5. Renate Mark and Jon Rohloff teamed up to win the 7.0 combo mixed doubles tournament at the Stinson Morrison Hecker Omaha Adult Open held May 27 – 30, 2011 at Koch Tennis Center. In the 1st round, they defeated Traci Harrison and Todd Muilenburg of Omaha 6-2, 6-0. In the semifinals, they defeated the No. 1 seed, Mary Seyler and Stephen Seyler of Omaha 6-3, 3-6, 6-3. In the final, they defeated the No. 2 seed, Liz Sambol and David Sambol of Omaha 6-3, 6-4. In other events, Mark Leahy, Jon Rohloff, and Dana Mark played in the 4.0 singles event. Mark defeated Jon Rohloff 6-0, 6-2, and Tommy Harris of Bellevue 6-2, 6-2 to reach the semifinals. He then downed the No. 1 seed, Kiran Poda in a marathon match 7-6, 6-7, 6-4. In the final, Mark withdrew with illness. John Rohloff defeated Skip Rice 7-5, 6-1 in round 1 of the 4.0 singles event, then lost to Mark Leahy 6-0, 6-2. Jon then defeated Skip Rice again in the consolation draw before losing in the consolation quarterfinals to William Dotzler of Sioux City, IA 6-4, 6-3. In 4.0 singles, Dana Mark lost to Kerrick Stack of Sioux City, SD in round 1, 6-1, 6-1, then defeated Nick Harlow of Omaha 6-3, 6-3 in the consolation draw. Dana then lost to William Dotzler of Sioux City, IA 6-3, 6-2. Mark Leahy also played in the 45 singles, where he defeated Brad Miller 7-5, 6-3 in the semifinals, and was leading 6-2, 5-5 in the final when he retired with illness. Mike Willman teamed up with Roland Augspurger of Columbus in the Men’s 4.5 doubles, losing a close 3-setter in round one to Jerry Brocky and Brian Richmeier of Omaha 3-6, 7-6(4), 7-6(8). Brian Mark and Jon Rohloff teamed up to play in the 4.0 doubles, losing in round one to Thomas Andrews and Matt Olsen of Omaha, 6-4, 6-4. In Men’s 45 doubles, Mick Willman and Roland Augspurger defeated Wesley Michaelson of Dakota Dunes, SD and James Michaelson of Brooklyn Park, MN in round one of a round robin 6-3, 6-0, then lost to Mark Leahy and Chris Westergaard 6-4, 0-6, 6-4. Mark Leahy and Chris Westergaard defeated Roland Augspurger and Mike Willman in round robin play, 6-4, 0-6, 6-4, and Wesley Michaelson and James Michaelson 6-0, 6-3, giving them the title in the 45 doubles. Congratulations to Mark Leahy of Fremont, who is shown here displaying his trophy after winning the 4.0 Men’s Singles Championship at the Omaha NTRP Adult Sponsored by RW Baird tournament on Monday, Sept. 6, 2010. Todd Hultman of Omaha, 6-1, 6-3. Jeff Holland of Omaha, 6-4, 6-1. Mark Jackson of Omaha, 6-1, 6-3. Robert Harris of Omaha, 7-6, 6-0.
and No. 1 seed, Joseph Shea of Omaha, 6-1, 6-3.